Lonavala is a hill station nicknamed as the jewel of Sahyadri Mountains near Mumbai in Maharashtra. The Lonavala Khandala Tour Package gives you the opportunity to experience something magnificent and beautiful, carrying a bag full of memories. An abundance of nature in form of cascading waterfalls, pristine woods and valleys, grassy expanses, lakes and ancient caves makes Lonavala mini paradise and perfect destination away from the hustle and bustle of city life. This trip will take you through the places with lush green surroundings, viewpoints and forts that are covered in greenery all over the place. Lonavala comes to life during the monsoon season as the countryside turns lush green with waterfalls and ponds. The Lonavala Khandala Tour Package is designed for people looking forward to spending some time in the pleasant surroundings of western ghats. 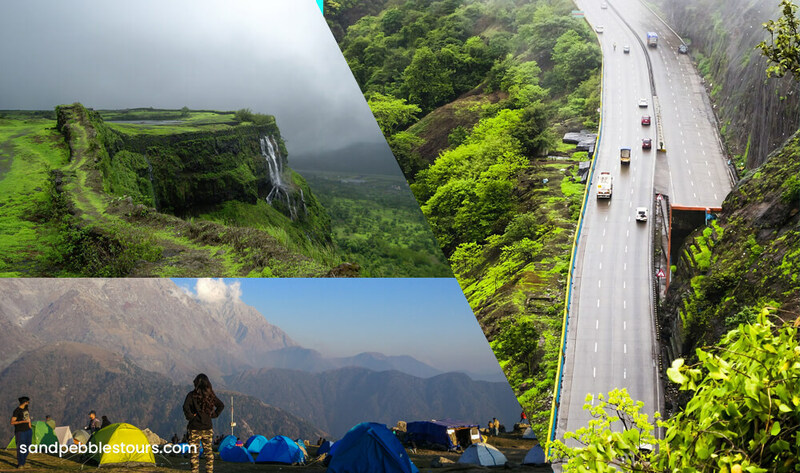 The ghats and valleys of Lonavala and Khandala are so beautiful and serene that can make your whole travelling experience amazing. The Lonavala Khandala Tour Package offers a perfect getaway to a relaxing place where one can have the best time of their lives. The hill stations in Khandala has seen the rise and fall of many kingdoms such as the Marathas, Peshwas and even the colonial power of European countries. Sand Pebbles Tour N Travel is offering 10 % discount on the occasion of Independence Day. We offer an exciting Lonavala Khandala Tour Package suitable for couples, friends or family. With our tour, you can have a holiday trip of your life that you have ever dreamed of. We ensure you will have a superb holiday experience with memories for a lifetime. Upon arrival at Mumbai airport/ railway station, pick up and transfer to Lonavala. On arrival, check-in to hotel. Lonavala has become famous because of nature’s gift like: valleys, hills, milky waterfalls, lush greenery and pleasant cool winds. This region is full of natural beauty. Lonavala is an epic poem created by God. The morning Sun rising over here appears as if it is sprinkling rose water all over. Chirping birds gently awaken oneself and all of this makes it a really Good Morning. Spend the rest of the day at leisure or you may choose to explore local markets to enjoy delicious foods of Lonavala. Overnight stay at Lonavala. Today, you will proceed to visit Bhushi Dam, which is the most famous spot in the whole town. It is a perfect spot for the picnickers. There remarkable waterfall, near the dam, is also very famous spot. Then visit the Ryewood Park, which is also located to the Lonavala market and offers a great view. The lawns are very well manicured, and you will find a variety of trees and colorful flowers. Later visit the Tungarli Lake, an artificial reservoir in Lonavala and a major source of water supply to Lonavala city. The remaining day is at leisure and later you retire for the night at Lonavala. Breakfast at the hotel. After breakfast visit Khandala (15 kms/30 minutes). By covering sightseeing places like: Karla Caves, Visapur Fort, Walwan Dam. Reach at Khandala and enjoy the views from those scenic locations in pleasant weather. Back to hotel for overnight stay at Lonavala. Post breakfast,check out from the hotel. Drive towards Mumbai for your return to home by train or flight.